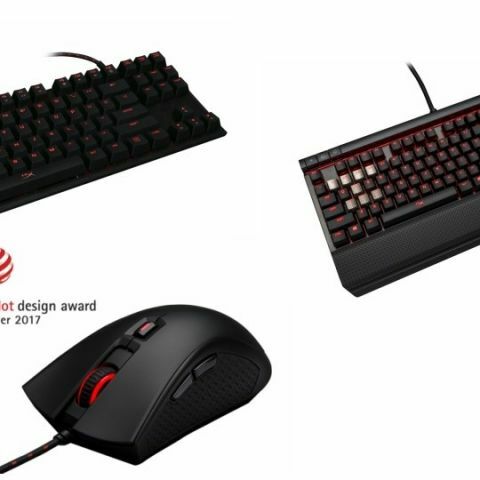 Kingston Technology's gaming division, HyperX, has launched its lineup of mechanical keyboards and the Pulsefire FPS Gaming Mouse in India. The mechanical keyboards include the Alloy Elite and Alloy Pro, which are priced at Rs 11,000 and Rs 7,499 respectively. The Pulsefire FPS Gaming Mouse is priced at Rs 3,000. The Alloy Elite Keyboard sports Cherry MX Mechanical switches, detachable palm rest and custom lighting. It features HyperX red backlighting, an 18 LED light bar and 6 preset LED effects. Other features include USB 2.0 pass through, titanium coloured and textured WASD keys and full N-Key rollover functionalities. The HyperX Pulsefire FPS Gaming Mouse features a PixArt 3310 and Omron switches. The mouse offers four DPI presets randing from 400 to 3200 DPI. The mouse weighs 95gms and is equipped with non-slip side grips. All three devices will be exclusively available on Amazon for a month, and will later be available on major Indian online and retail stores.